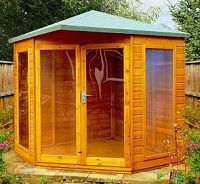 If you don't have a particularly large garden a corner summer house can be the ideal solution when you're looking for a garden building for outdoor living which doesn't take up too much valuable space. 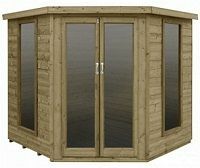 However, if you want to buy one online (and online is the best option for price and convenience) you'll find a confusing array of models scattered all over the internet, many easily missed in larger garden, building and DIY sites and often with different names used for the same model. 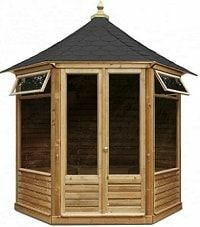 The Corner Summer House Guide is a website dedicated to the UK corner summer house buyer. The aim of the site is to bring together all the corner summer houses available online in the UK in one place with full details and our unique price guide to help the buyer make an informed choice. 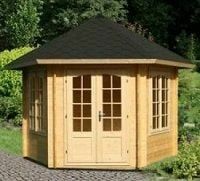 All the summer houses are featured on this page but to make it easy to find exactly what you're looking for you can select by size from the menus above..
We're continually adding new summer houses to make sure that you have access to the latest models, prices and details together with the widest range gathered in one place on the internet. 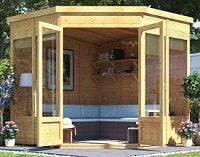 And we've now added a promotional code check so you can see at a glance if there are any codes, deals or offers available to help you buy your ideal summerhouse. 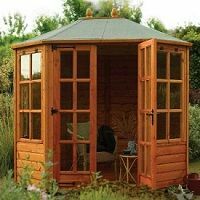 A classy and stylistic hexagonal summer house featuring pressure treated timbers and toughened glass - available in two sizes; 7'10'' x 6'10'' and 8'10'' x 7'7'' pure class! 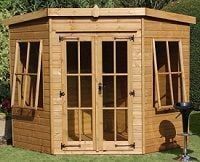 A substantial 8'x8' corner summer house with an attractive apex roof and spacious interior - pressure treated timbers mean reduced maintenance! 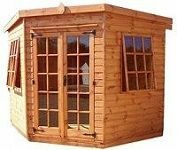 An appealing and spacious 10'x10' pentagonalcorner summer house in 28mm interlocking pine log construction - not a budget model but true quality! 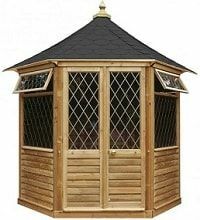 A larger 13'1'' x 13'1'' version of the 3 x 3 model in a similar design with double doors and even more space - great value! Outdoor living is becoming increasingly popular these days. Properly organised, the garden can become an extension of the home living area, providing a valuable facility at all times of the year. Let's face it though - while it might be getting a little milder our climate is certainly not getting any drier - and if we want to enjoy our gardens to the maximum it will be necessary from time to time to provide refuge from the elements. 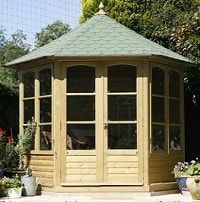 For the garden where space is at a premium this is where the corner summer house comes into its own. Occupying an otherwise unused corner of the garden it provides shelter from showers and shade from the sun in the summer months. In winter it provides an outdoor escape from the cold, the wind and the snow. 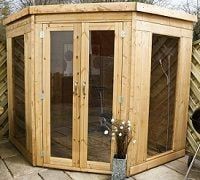 From your corner summerhouse you can survey your garden from the comfort of the indoors in an outdoor setting no matter the season or the weather. 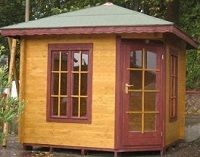 Corner summer houses are available in a variety of styles ranging from the simple and unobtrusive to the imposing - just have a look above. 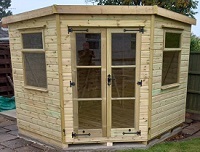 The majority are delivered in a ready to assemble form, ideal for the diy enthusiast, but most also come with an installation service available, sometimes included, often at additional cost. 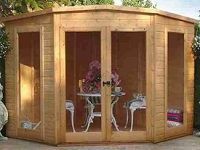 Either way the purchase, delivery and erection of a corner summer house is a reasonably straightforward matter and the enhancement of your garden is well worth it. 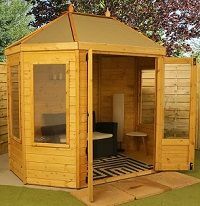 Once the structure is in place you can personalise your corner building and turn it into your own outdoor haven, decorated and equipped entirely to your taste. 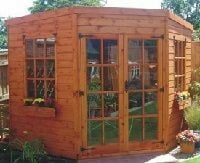 Most models arrive pre-treated with a timber preservative and requiring only a suitable external finish - an ideal opportunity to decorate the summer house to fit perfectly with your garden. 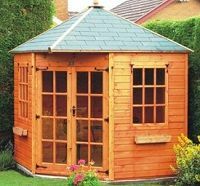 Many sellers offer the option to order a suitable finish along with the summerhouse, usually for application by the purchaser, or you can obtain a finish from a reputable DIY store. Styles and fashions change. 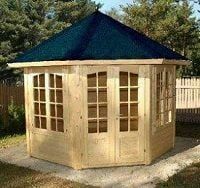 At present the usual finish for a corner summer house is with a timber stain; pine, mahogany, rosewood, walnut and the like, but stains and paints are available in other colours to suit your preference. 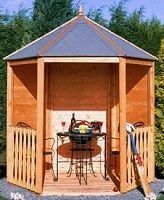 You'll find some interesting ideas as you browse our summer house selection above. Otherwise, all you really need before your building is delivered is a suitable base. This need not be a big issue. A wide variety of pre-formed bases are now available in addition to more traditional solutions such as paving and concrete. 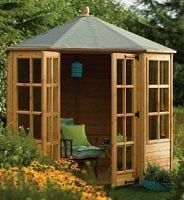 Check out our feature on Corner Summer House Bases for some great ideas and plenty of information (link opens in a new window). A corner summer house is for all seasons, not just the summer. 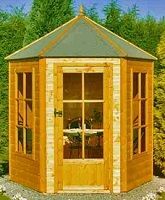 Browse the selection above and we're sure you'll find the ideal model for your garden. 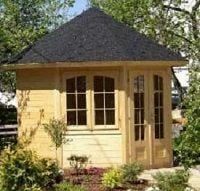 There are a large number of corner summer houses on the site - if you see any that take your fancy just add their pages to the favourites or bookmark list in your browser and come back to compare them once you're done. We try our best to make details of the summer houses and prices available in a clear and straightforward manner. We won't try to bamboozle you with jargon or waffle or to drive you to distraction with annoying pop ups, confusing offers and other gimmicks. We tell you everything you need to know - clearly and simply. 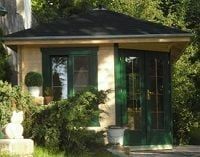 To help you home in on your ideal corner summer house you'll see that in the menu at the top of each page we've divided buildings into categories according to price, size and style. Visit these pages to narrow down your choices from the huge range on offer to suit your requirements. To make life easier we've added a promotional code checker which opens in a new window and lets you check all the available current codes applicable to the summer houses and sellers we feature. No need to trawl the net for irrelevant, invalid, expired or non existent codes ever again! A whole industry has grown up dedicated to wasting your time by purporting to offer deals and voucher codes which in reality are either non-existent or unlikely to meet your needs. 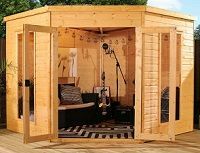 Here at the Corner Summer House Guide we go the extra mile to track down and feature only valid and relevant codes to help you with the purchase of your garden building and related items. 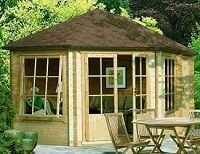 We can offer this service as we're genuinely dedicated only to the corner summer house purchaser and don't have to try to tempt buyers with what look like catch all codes and offers which are in reality worthless, or at most don't offer anything over and above what you would get by simply visiting the seller's site anyway. So use our promotional code checker with confidence. Depending on what's available it may not always feature a large amount of voucher codes or offers but you can be sure that what you find there will be relevant to your purchase. 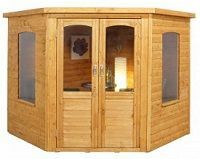 You should be aware that many corner summer houses are supplied to one basic design by the manufacturer but renamed and sometimes customised by suppliers. This explains why many buildings with different names look very similar with only superficial differences. Where possible we have tried to group different examples of the same summer house together to reduce confusion. When ordering check delivery areas and prices carefully. Not all suppliers will deliver throughout the UK and many will make an extra charge for some areas. Similarly, if you require an assembly/erection service ensure that this is offered in your area before placing an order. Different suppliers sometimes offer different options when it comes to finishes, accessories, trims etc and these can vary from time to time. When pricing your summer house please remember to make sure you're comparing like for like. And finally, the measurements given on the site are provided by the suppliers and are indicative only. 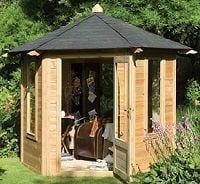 When erected there may be variations in the final dimensions of any particular summer house - we're afraid we can't accept liability for any discrepancies. P.S. How do we keep all this freely available to users? Well, in some cases when you click through to one of our sellers and buy your corner summer house online the Corner Summer House Guide will receive a small commission. This is called 'affiliate marketing'. 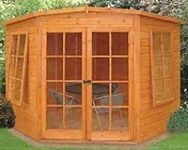 There's no extra cost to you the corner summer house buyer, nor does it apply in the case of all the sellers on the site or influence which sellers we list in our price comparisons - we work hard to maintain our status as an independent guide and reviewer. Where we do receive a commission however it helps us to maintain a useful and up to date service at no charge. So please do support our sellers and thank you for buying your summer house through the Corner Summer House Guide.